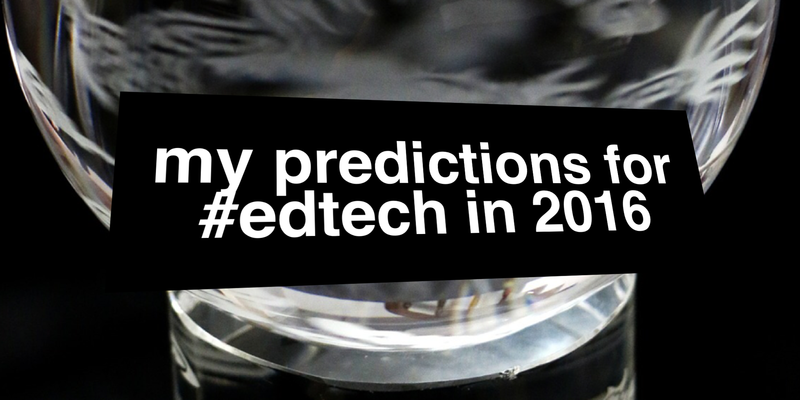 Lots of emails and tweets are flying around at the moment with their predictions for a number of things such as edtech in 2016, and there certainly seem to be some fantastic developments in the pipeline for technology in education. For sure, there’ll be lots of talk and developments in 2016 – for me I think there will definitely be a number of growth areas, particularly surrounding mobile learning for older students KS3 and above. That may mean simply mobile within the classroom from class sets of tablets, particularly iPad because of its fantastic OS and form factor. I can certainly see from a price point of view where lots and lots of schools will choose to go Chromebook too. Some schools will join the ever increasing family of schools using Firefly, particularly from the independent sector whereas others will migrate to Office 365 or Google Apps for Education and continue the slow but obvious migration to cloud working. Flipped learning and free LMS such as Google Classroom will continue to explode too. Microsoft’s ‘Class Dashboard’ will be released and provide some competition to the well established Google Classroom product. The big thing for me for 2016 however won’t be the ground breaking innovations of augmented reality in the classroom, the growth market of brilliant connected toys to support the STEM/STEAM curriculum; or the use of beacons or even the ease in which we can use maker technologies in the classroom completing things like genius hour projects. This will take place in the most innovative (and important) schools to lay the ground out for those that follow. The big thing I believe for 2016 though will be (and certainly should be) firstly putting to rest a number of things linked to education technology that have hounded it for years. Finally, evidence should come to bear which proves that having sound teaching and learning in your school, supported by good technology use, will and does have a positive impact on standards and outcomes. Secondly, I believe 2016 will be the year where schools will (and should) look to make technology more embedded in classrooms across the land. The advice from the OECD was clear – more technology, not less, is the key to getting impact in the classroom – alongside serious and quality CPD for teachers so that they have the confidence and competence (TPACK / 4 stages of confidence) to not only want to use technology in their classrooms, but to know when it is right to use technology to support and enhance learning. Quite rightly, more and more the governing bodies of schools across the land want to see impact from the investment in technologies that take place in the schools that they serve. 2016 should be about making that happen. Making it clear. Making it obvious. Making it happen. Thirdly and maybe most importantly, in 2016, schools will (should) realise that in order for technology to work well in supporting learning in the classroom the conditions for success need to be in place first. iPads are amazing but they are not plasters to heal poor teaching, poor technology infrastructure in schools, poor leadership and poor behaviour from the children. Get the conditions for success right and just like the proverbial sunflower, the technology will flourish – get that wrong or if that isn’t right, then you might as well not bother because there’s no plaster for that (as my good friend Nina Jackson would say). For too long we (educators) have spent thousands on equipment for our schools which can end up languishing in cupboards, never reaching their edtech dreams. 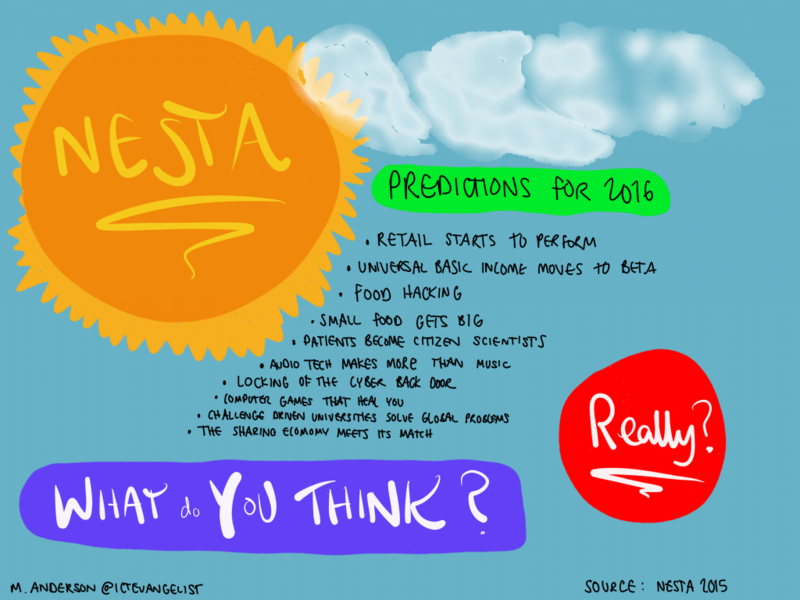 Let’s use 2016 to get IT right! And for those trailblazers who already do – may the force be with you!